The Movement for Democratic Change was always going to be a broad church. From its foundation in 1999, it has brought together city workers and farm labourers, small businessmen and big landowners, Zimbabwe's Shona majority and the Ndebele minority, as well as a small number of white Zimbabweans. What united these people was their dissatisfaction with President Robert Mugabe's government, be it on the grounds of human rights abuses or the steady collapse of the economy with its consequent job losses, shortages and growing poverty. From the start, sceptics predicted that this alliance would collapse under the weight of the conflicting interests of its broad constituency, as soon as its focus moved beyond the immediate wish to replace Mr Mugabe. But with Mr Mugabe still firmly in power, the strains are starting to show - and the fundamental differences seem to be over strategy. The current crisis began when the ruling Zanu-PF party changed the constitution to reintroduce a Senate, an institution that was abolished in 1987. Fifty senators are to be elected on a constituency basis on 26 November; the new upper house will also include a further six senators appointed by the president, and 10 traditional chiefs. 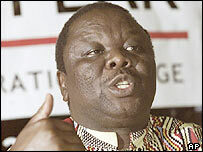 Mr Tsvangirai wants the party to stay out of the Senate elections. The other five of the party's six top officials, led by secretary general Welshman Ncube, want to participate - and 26 party members have gone ahead and registered their candidacy. The Ncube faction says that in declaring a boycott, Mr Tsvangirai overrode a decision taken democratically by the party's structures. Although Mr Tsvangirai's stance has left him looking isolated among the party leadership, his views resonate with those of many Zimbabweans who feel the Senate is a waste of money, and exists mainly for President Mugabe to hand out jobs to more of his political allies. The National Constitutional Assembly - a coalition of pro-democracy civil society groups - is also supporting a boycott of the Senate elections, believing it was conceived only as the result of an undemocratic constitutional change. At the moment, neither faction is prepared to concede that the other side might have a point. Party spokesman Paul Themba-Nyathi - who favours participation - earlier this week described Mr Tsvangirai's views as "unfortunate", as though the opinions of the party leader were not particularly relevant. Mr Tsvangirai's spokesman, William Bango, insisted that the 26 MDC members who had registered their candidacy had done so in their personal capacity - and that to have registered in the name of the MDC was an act of fraud. He said that while the party leader was seeking a "political solution" to the crisis, disciplinary action against those who had registered could not be ruled. Some commentators speak of an ethnic split - and it is true that Mr Tsvangirai is from the majority Shona ethnic group, and his five most prominent opponents within the party are from the Ndebele minority. But in another sense, the split represents a philosophical difference: can structures like the Senate be a valuable platform for the MDC to put its views, or will the presence of the opposition simply grant legitimacy to an electoral system which in the past has been manipulated by the ruling party to its own advantage? In the western Ndebele heartland, the MDC already controls the city of Bulawayo and is an established political force - it is perhaps understandable that party members in the region are more confident about being able to work within the system than is the case with their colleagues elsewhere in the country. But whatever real differences may exist, there are signs that the Zimbabwean state is doing its best to exploit them, and to turn a disagreement over strategy into a full-blown crisis. Since the MDC is the only party that has ever posed a serious challenge to Zanu-PF rule, the current mess has obvious benefits for the ruling party. Mr Tsvangirai believes the nominations court - the body responsible for registering candidates - came under pressure from the state security services to register candidates in the name of the MDC, against the party leader's own instructions. The Tsvangirai camp maintains that the Central Intelligence Organisation is actively supporting the electoral ambitions of the 26 candidates. "What is particularly worrying is the information we received indicating that some of these candidates were brought into the city by the CIO and driven to the nomination court a few minutes before 4pm yesterday [Monday, the nomination deadline]," Last Maengahama, MDC secretary for Harare province, said in a statement. The state-controlled media has made much of the divisions within the MDC, running headlines such as "The people versus Morgan Tsvangirai". MDC officials admit that the row has already damaged the party's prospects. Even if MDC candidates were to win all 26 seats that they are contesting - itself an unlikely outcome - Zanu-PF would still control the senate. 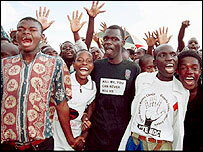 MDC activists remain optimistic that they can overcome their differences. But for the moment, both sides are sticking firmly to their positions - and there is no indication of who will blink first.